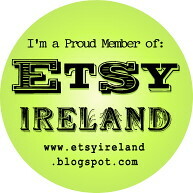 I really need to get better at this blog thing! Unfortunately with four kids and nearly nine weeks of summer holidays to fill, it has been a bit impossible to find time to sit and write on the blog! I’m sure there are many of you out there who know exactly what I’m talking about! But it doesn’t mean I haven’t been busy creating and making things, that never stops! Babies, babies and more babies!! So many people around me have had babies lately, and while i am glad to be over that stage, I absolutely love any excuse to make gifts for bubs! One of my close friends had a baby boy in a lovely home birth in July. She is part of the craft group I have been in the last four years (since moving to Ireland…don’t know where I would be without my craft girls!). 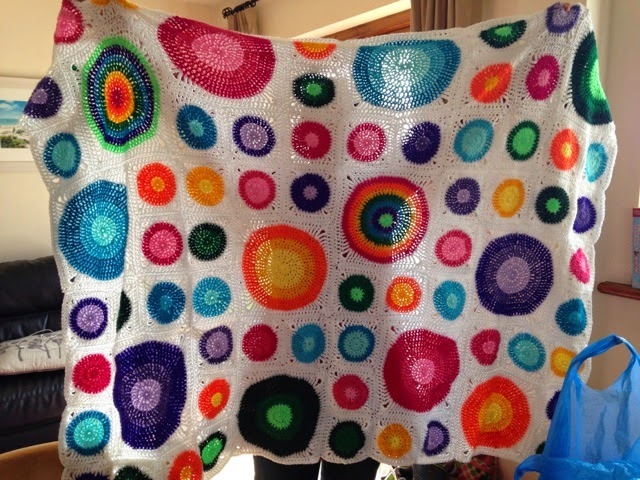 Sneakily, another close friend and I crocheted a blanket for her based on a circles pattern we found on this blog: Just Do. My friend loves circles and bright colours, so we went for this bold, rainbow pattern. I must admit the circles were a bit tricky to get started and began to fall apart, I think because I started mine all wrong!!!! But despite that, it was a quick & easy project and the end result looks brilliant, my friend loved it and it looked so snuggly cuddled around the baby! Another close friend of mine was due a few weeks later. 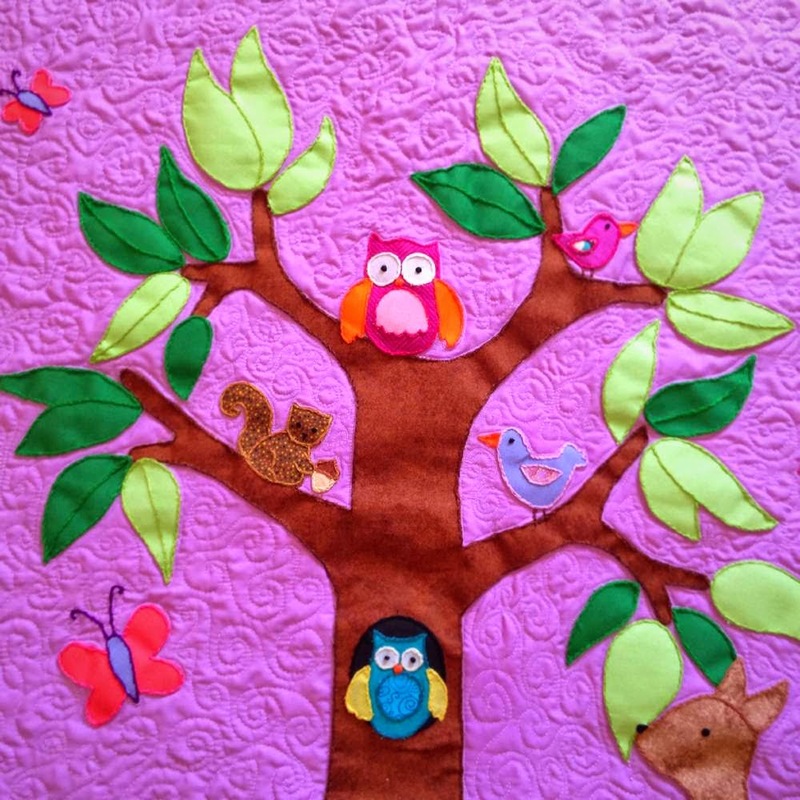 I had made her baby boy a Noah’s Ark quilt two years ago when he was born which she loved and is now hanging up in his room. After finding out she was expecting a girl, I couldn’t wait to tuck into my pink and coral colours, especially some of the new Sarah Jane Wee Wander fabrics I had just ordered. 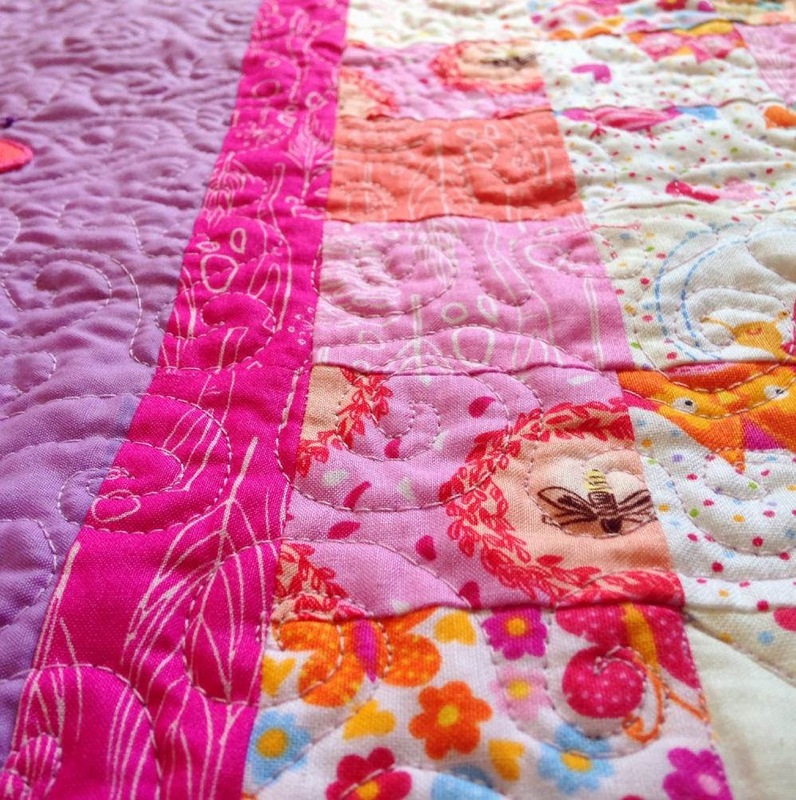 I found this quilt pattern on Sarah Jane’s blog and adapted it to suit the same size quilt I had made before. But instead of using a fabric panel (way too boring for me!!! ), I always have to complicate things by coming up with my own design. I chose a woodland scene for inspiration, (from wallartdesign on Etsy) and drew it to size so could trace my creatures onto some ‘heat & bond’ to stick to my backing fabric. I chose a lilac purple instead of a usual blue sky colour as I think it brought out the creatures more (the real truth is that I live in the west of Ireland where getting fabric is not so easy as popping down to the local craft store…so sometimes you have to make do with what you’ve got…..but don’t tell anyone that…I REALLY MEANT to choose that colour!). Anyway, apart from my 6 year old telling me the background should really be blue (aargh!! ), I think it turned out great, particularly with the matching corals in the patchwork panels. I hand embroidered around all the the creatures and the tree using split stitch which took some time but was a good holiday project to take away with me. There is nothing quite like quilting on a camping chair in the shade, sipping a gin & tonic outside the caravan! I quilted it myself using spirals all over the quilt sandwiched with some nice cotton batting and the same lilac fabric on the back. I don’t have one of those fancy quilting machines or even the quilting attachment boards for your machine, so while it’s a bit fiddly to do, I love the challenge of it. 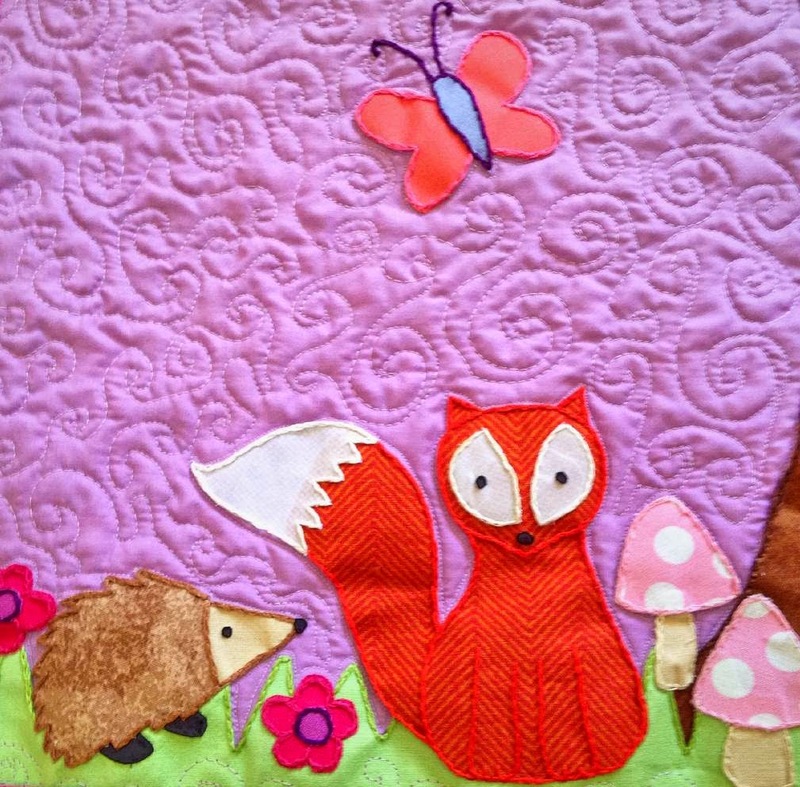 I actually find the quilting bit the most fun to do & wouldn’t get the same satisfaction having someone else do it for me! 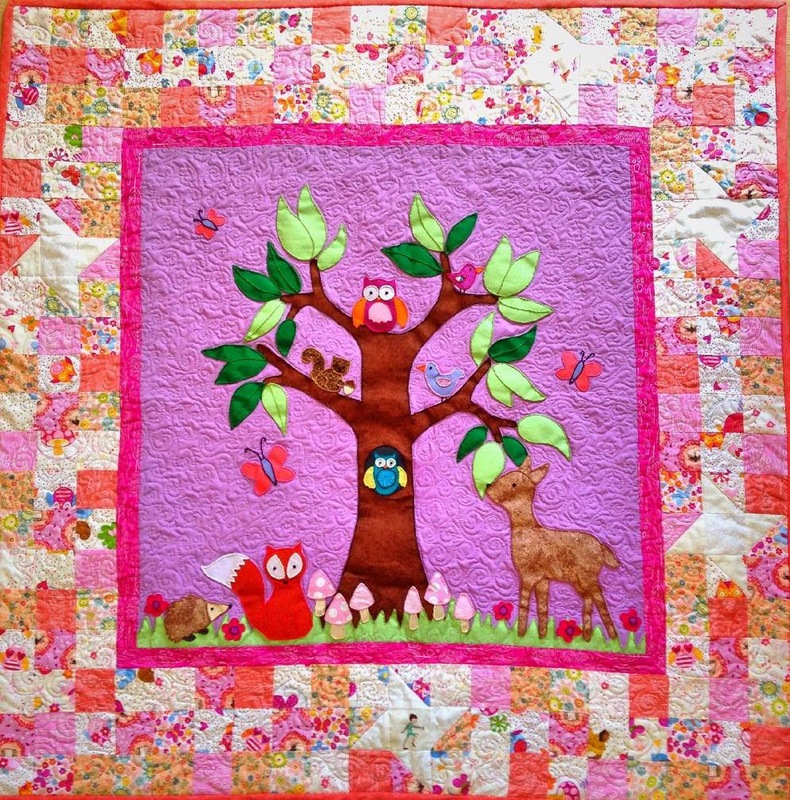 I love seeing the picture revealed and stand out when you quilt around it. So…despite a long break between blogs, I have been busy…..I’ve also made at least 7 dolls too & some more Halloween monster dolls! 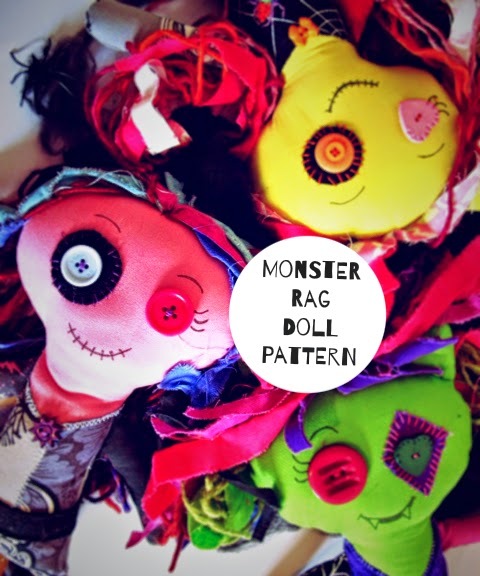 Don’t forget you can now buy my Monster Doll pattern on my Etsy store! I am soooo excited to have a pattern up for sale, finally!! If you’ve ever written a pattern you will know how laborious the process is! Hopefully there will be more to come soon!